“Another phase of financial aid distribution shall be undertaken on March 1, 2012, 1:00pm at the City Tourism Hall,” City Mayor Vicente ‘Dongkoy’ Y. Emano announced. For all typhoon Sendong victims from Biasong, Tibasak, Cala-cala, Tambo, St. Ignatius, and Tomasaco, a total of P12,043,500.00 shall be given out this time. A total of P31,786,900.00 has been so far distributed during the past 4 phases of cash distribution to the Sendong affected families in the city. The Estate Management Division (EMD) has declared that it cannot yet put on ‘hold’ some beneficiaries whose occupancy at the Tent City are considered questionable. This is what EMD Chief Ms. Virginia Diguinion revealed when reports about temporary shelters being occupied by people other than the registered occupants reached her office. “We cannot just put them on hold because they are, after all, entitled to the relocation. What we can do, however, is to conduct a thorough investigation so that we can have legal basis should we actually need to put them on hold,” Diguinion said. According to the daily monitoring records on the Calaanan Tent Cities made by the EMD staff, Rubina Castro and Maryjane Alipoyo, there are tents wherein the current occupants are no longer the original legitimate beneficiaries. Due to these findings, Castro and Alipoyo wished to recommend to put on hold the aforementioned beneficiaries from joining the raffling for the permanent housing units until their questionable tent ownership are resolved. 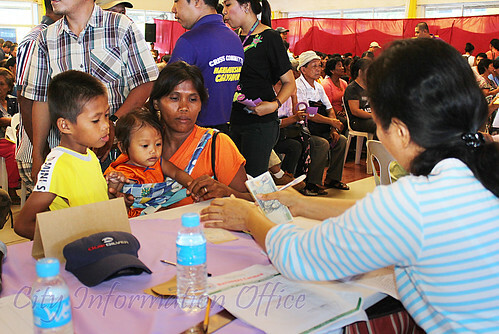 The beneficiaries in Tent City 1 are identified as Miguelito Moring of Tent No. 143; Leoncio Zapanta of Tent No. 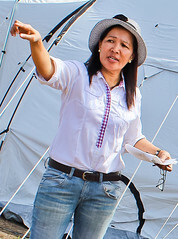 107; and Elizabeth Bonghanoy of Tent No. 176, all residents of Isla de Oro. Per EMD’s 2003 survey records, Moring, Zapanta, and Bonghanoy were all house owners in Isla de Oro. “But sometime before the typhoon Sendong, they have already sold their houses in Isla de Oro, and yet they, instead of the new owners, claimed the rights to the temporary shelters in Calaanan,” Castro reported. A certain Josefina Candelosa was the buyer of Moring’s house; Nelson Enerio was the buyer of Zapanta’s house; while Bonghanoy herself admitted that she had long sold her house to someone who is now temporarily billeted at the City Central School. The EMD also discovered other odd circumstances like the situation in the tent of Joel Ayop, a resident of USA, Tibasak, Macasandig, where it was disclosed that the woman living with him in the tent is not his wife, Arlene. Similarly, Fidel Sebastian, a resident of Isla de Oro, was also found to be sharing his tent with some other woman instead of his wife, Wilma. By virtue of these findings, Ms. Diguinion ordered a thorough investigation in order to acquire facts and legal documents upon which the EMD can base their next course of action. She called on and encouraged the beneficiary wives who were denied access to their tents (by their husbands) to write to the office of the EMD so a proper investigation can commence. City Mayor Vicente “Dongkoy” Y. Emano sadly and regretfully asked for forbearance from the inhabitants of Isla Delta and Bugnao because in spite of his efforts to give them electricity, even for just the time being, CEPALCO has denied the request due to orders from higher up. In fact, there is already an order for all inhabitants to be permanently moved away from the above-mentioned islets. “I tried my best, and I pity everyone especially the children, but, these are beyond me now because the orders said so. I hope everyone understands…I’m sorry,” expressed the Mayor. 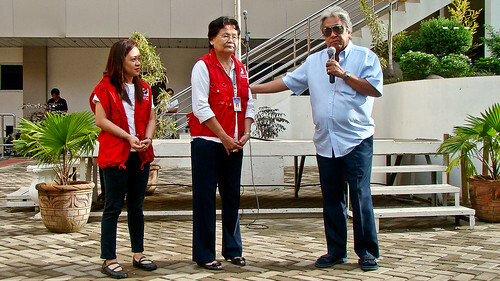 City Mayor Vicente “Dongkoy” Y. Emano acknowledges and thanks the National Government through DSWD Social Welfare Officer V Ms. Purita Santa (center) during the turnover of 5 Million pesos for the City’s Supplemental Feeding Program intended for the feeding of malnourished children especially in the day care centers. City Mayor Vicente “Donkoy” Y. Emano thanked the Department of Social Welfare and Development R10 after the regional office handed over P5 Million for the supplemental feeding program. The P5M financial aid was formally turned over by representatives of DSWD-10 to Mayor Emano during the recent flagraising ceremony at the City Hall. “This is a huge help for the nutrition and health of the children in the various day care centers in the whole city,” the Mayor said. The object of the suspension and recall movement himself, Mayor Vicente Emano, instead of lashing out at the opposition, is giving hints and suggestions to the proponents of the recall movement regarding the right ways to make their cause of removing him more viable. “The case they filed with Malacañang about their desire to have me suspended was sloppily prepared,” the Mayor stated. It is known that the opposition has filed an administrative case against Emano appealing to the president to suspend the mayor if found guilty, after a thorough investigation, of contributing to the death of thousands when the typhoon Sendong struck the city. “The prayer of the case they filed against me in Malacañang called for my suspension AFTER the investigation. What this means is, should I ever be suspended, it would first take a considerably long time because I would have to be investigated first. The better course of action would have been to ask the president that I be put under preventive suspension while the investigation is going on,” suggested the Mayor. It was pointed out that it was Senator Koko Pimentel himself who brought the case filed against Emano to Malacañang. Pimentel is considered to be one of the pillars of the opposition in the city. Besides the move for suspension, a signature campaign has been initiated and is continuing even now to cause a special election in line with the movement to recall Emano. But Emano contends that a recall takes a lot of work, and thus a long time to complete. to make sure that these were not fake, that the signatories are registered voters, that they are residents of Cagayan de Oro, that they were not coerced to sign. Really, takes a lot of work,” the mayor further said. In addition, the lawyer who would certify the collection of signatures needs to be very meticulous and watchful as his career could be put on the line in case he certified a fake signature, an unregistered voter, a non-Cagayan de Oro resident, or a coerced signatory. It was revealed that there have been several signatories who executed affidavits after they complained of being made to sign under the pretense of being given aid but later learned that the papers were those of the movement to recall Emano. An important requisite of the Commission on Elections (Comelec) in order to hold an election in the city is the requirement of 45,000 signatures from registered voters of Cagayan de Oro. A group called Save CDO Movement, composed of the opposition and the critics of Emano, initiated this signature campaign. “By April this year, more or less 500 houses built by Habitat for Humanity Philippines, and not less than 100 houses built by the local government, will soon be occupied by families who lost their homes,” City Mayor Vicente ‘Dongkoy’ Y. Emano hoped. “We’ll do the best the city government can, with the help and support of the Habitat for Humanity Philippines, to have our homeless brothers and sisters occupy permanent homes starting April,” the Mayor promised. 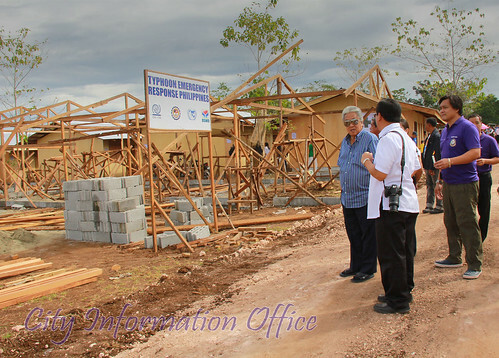 It can be recalled that 1,500 quadruplex type houses are being constructed now by Habitat for Humanity Philippines in the Calaanan Relocatin Site, while 1,000 row-houses are also being built by the city from the aid given by the national government and other donations. More than Thirty-Two Million Pesos (P32,000,000.00) as initial financial aid has been distributed to the flood victims so far by the local government, according to City Mayor Vicente ‘Dongkoy’ Y. Emano. “In this fourth (4th) phase of the financial aid distribution, 1,858 families received aid totalling P7.8M from the city’s 5% Calamity Fund,” the mayor further said. In line with this, the Mayor again asks for consideration and patience from those other victims who have yet to receive their share of the financial aid as the verification and validation is a very necessary process. “Construction of the 500 houses in Xavier Ecoville, Barangay Lumbia, as permanent homes for the Sendong victims has began,” City Mayor Vicente “Dongkoy” Y. Emano announced. This, after the mayor thanked XU President Fr. Roberto ‘Bobby’ Yap, and XU Board of Trustees Chair Eng’r. Elpie Paras, during the recent signing of the Memorandum of Agreement for the above-mentioned objective. 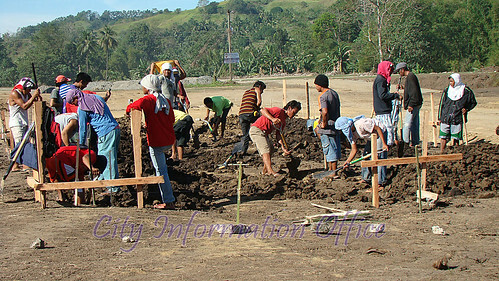 The 5-hectare permanent relocation site, which is owned by the Xavier University, is a joint project of the Xavier University and the local government, in accordance with the efforts of Mayor Vicente “Dongkoy” Y. Emano to relocate in the soonest possible time the families who were affected by the typhoon Sendong. City Mayor Vicente “Dongkoy” Y. Emano (right), Xavier University President Fr. Roberto ‘Bobby’ Yap (center), and XU Board of Trustees Chairman Engr. 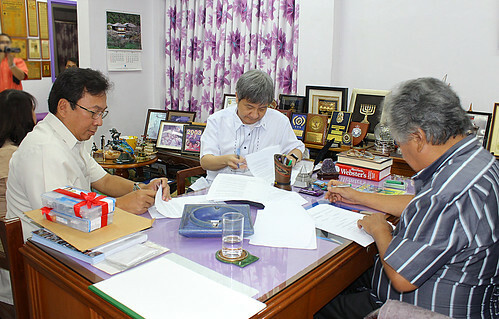 Elpidio M. Paras (left), signed the Memorandum of Agreement for the Xavier Ecoville relocation area located in Lumbia, February 21, 2012. The first completed permanent housing units were turned over to some beneficiaries last January 25, 2012, during the blessing of the XU Ecoville where the Mayor was also in attendance.